This bed is absolutely beautiful; however, the bed was delivered absent the instructions and all of the parts and screws. It took 4 phone calls to get the pieces to put the bed together and we had to sleep on the floor for a whole week. The customer service department was wonderful and we were grateful to get the bed put together. Add modern style to your bedroom with this stunning upholstered bed. The Elle collection by Jennifer Taylor Home is a perfect combination of modern and traditional styles, this wingback headboard bed and the nailhead trim gives it a touch of luxury. 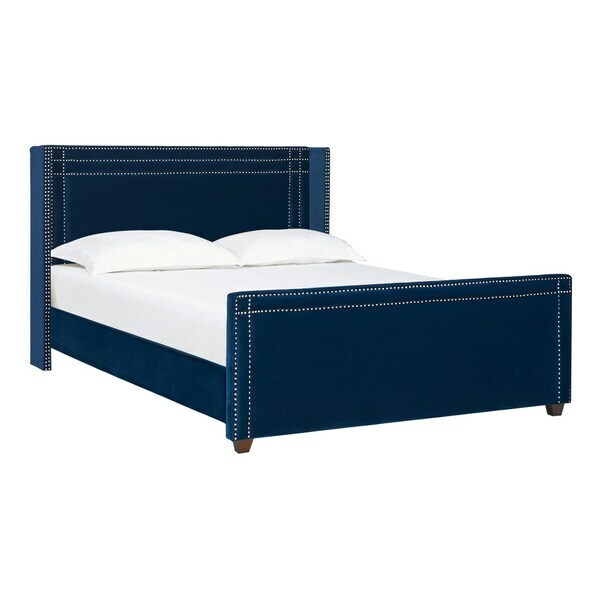 Available in king and queen sizes, this bed is easy to match with your personal decor style. *The digital images we display have the most accurate color possible. However, due to differences in computer monitors, we cannot be responsible for variations in color between the actual product and your screen. If it is important that the sample be exact, we highly recommended that you order a swatch sample first, before placing the order. Dimensions 83.0 In. X 88.0 In. X 54.0 In. Absolutely love this bed - as do our guests - always compliments!!! I think it's so nice, I've bought it twice! The blue is stunning and really stands out. I also love how it doesn't look like the typical upholstered bed. Feels great to the touch. You won't regret buying it. Yes, adjustable base with fit in this beautiful bed. "How can I obtain a fabric swatch of the navy headboard material?" We are not able to provide a fabric swatch, I apologize for the inconvenience. "does this bed require/accomodate a box spring?" Hello Simona, yes this uses a box spring. Have a great day! "Does the upholstery on the headboard go all the way down to the frame or is there a gap?" Hello gamama, the headboard only goes just past the mattress and does not go all the way to the frame. Thanks for shopping with us!